This is one of those beers that brings back fond memories of when I started really appreciating craft beer with my good friend Chris. Back in 1994 I was fortunate enough to stumble upon Batch 1 of the “Adambier”. I had moved away to college and was keeping in contact with my good friend Chris via electronic mail and instant message on this thing called AOL. We mainly talked about different stouts that we’d tried and one day he told me about this great beer he had found called “Hair of the Dog”. It was so complex and unlike anything he’d ever tried before. I was intrigued and set out to find this “Hair of the Dog” beer. I was attending Cal Poly San Luis Obispo and my off-campus apartment was walking distance from the local liquor store. So I hopped on my skateboard and headed over to check to see if they had it. Yep, they had it. When I brought it to the counter the guy at the register gave me a knowing smile and said, “Ah, now that’s a good beer”. I told him that’s what I’d heard from a friend, and was going to give it a try for myself. I rode home, poured myself a glass, and fired up the computer… while discussing the Adambier with my friend Chris, he mentioned that his bottle had a 4 on it. I told him mine had a 1. So I lucked into a chance encounter with a bottle from the first batch. The rest, as they say, is history. 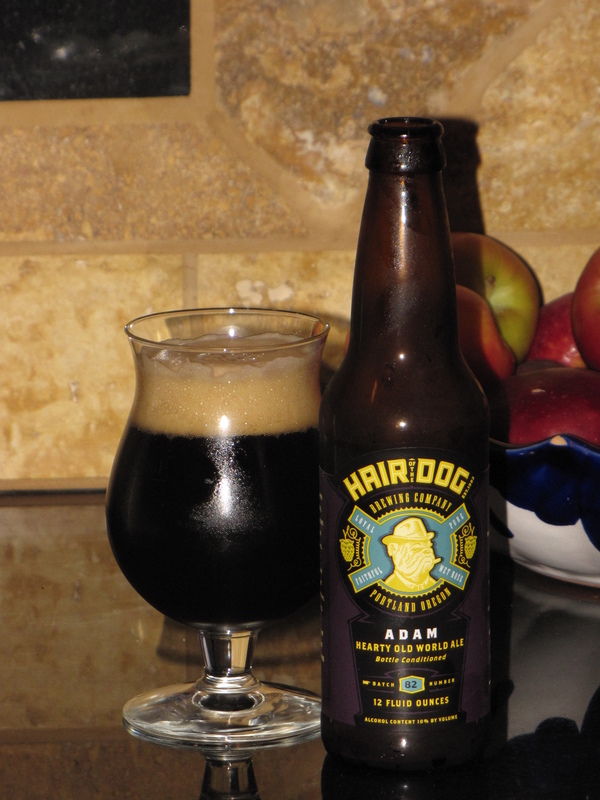 Hair of the Dog Adam was originally called Adambier after a German beer style that was no longer being produced. The inspiration for Adam and for Hair of the Dog Brewing came from Fred Eckhardt while he was speaking about beer styles that had fallen to extinction. One more special variety may be noted, and that is the strong ten-years-old ale known by the people of Dortmund as “Adam.” It is mentioned by Corvin in An Autobiography, who relates that “When King Frederick William IV of Prussia visited Dortmund a deputation of the magistrates waited upon him, one of them bearing a salver with a large tankard filled with Adam. When the King asked what it was, and heard that it was the celebrated beer, he said ‘Very Welcome, for it is extremely warm,’ and drained off the contents of the tankard at a draught. The members of the deputation, smiled at each other, for they knew what would be the result. His Majesty was unconscious for more than twenty-four hours.”from The Curiosities of Ale & Beer, An Entertaining Historyby John Bickerdyke, Spring Books, London, first published in 1889, 1965. Dedicated to the Brewers of the United Kingdom and all who value Honest Malt Liquor. The beer I’m reviewing is from Batch Number 82. On the bottle it says “Hair of the Dog Brewing Company, Est. 1993, Loyal, Pure, Faithful, Wet Nose, Portland Oregon, ADAM, Hearty Old World Ale, Bottle Conditioned”. It pours a rich dark color, almost black, with a thick foamy head. The predominant nose is roasted malt and chocolate. Before I even took my first sip I was impressed with the look of the beer in the glass. I held it up to the light and prepared myself for the blast of flavors I knew I was about to experience. At 10% ABV this is a sipping beer, and one that is worthy of the time you’ll invest to finish it. Adam is made with Northwest hops, Organic Pilsner malt and a variety of specialty grains. The flavors in this beer have been compared to chocolate, smoke, leather and figs. I remember giving guys grief for taking too long to finish their beers when I was a bar hopper in my younger days. So it’s with a heavy heart that I confess to you that it takes me a good hour to drink a glass of Adam. For that reason I tend to enjoy this as an after dinner drink with dessert. Usually something rich and chocolatey as I think it compliments those flavors quite well. As the beer warms up the sweetness really develops. I can see the fig comparison after about twenty minutes in the glass, until then it’s really just malty sweetness for me. At the one hour mark… (where I’m at now) it’s almost too sweet to drink, kind of like a sherry. But that’s okay, it’s also gone. So I’m guessing that by now you can already tell where I’m headed with my bottlecap rating. This is a 5 cap beer in my book, always has been, always will be. P.S. This is a bottle conditioned ale which is meant to be aged. I wish I knew then what I know now, as it would have been way cool to say that I still had a bottle of Batch 1 aging in my beer cellar. But alas, I was young and naïve. This entry was posted in Ale, Craft Brew, Review and tagged 10%, 5 caps, Adam, Adambier, Ale, Hair of the Dog, Hearty Old World Ale, Portland by Erik. Bookmark the permalink.